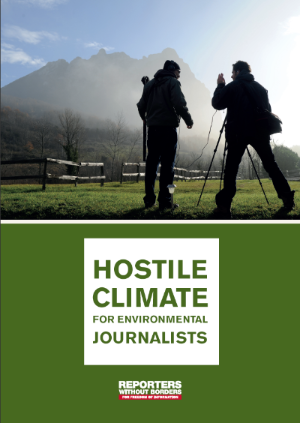 As Paris prepares to host the COP21 Climate Change Conference over the next two weeks, Reporters Without Borders has released a report entitled “Hostile climate for environmental journalists” that examines the often tragic difficulties for reporters covering environmental issues. With the environment now recognized as a major challenge for humankind, Reporters Without Borders believes that particular attention should be paid to the journalists who take greats risk to investigate sensitive, environment-related subjects. The report highlights a steady deterioration in the situation for environmental reporters, who are increasingly exposed to many kinds of pressure, threats and violence. Ten environmental journalists have been murdered since 2010, according to the tally kept by Reporters Without Borders. In the past five years, almost all (90 percent) of these murders have been in South Asia (India) and Southeast Asia (Cambodia, Philippines and Indonesia). Two Indian reporters, Jagendra Singh and Sandeep Kothari, were killed in 2015. Some journalists are threatened, attacked or jailed because of their reporting. At least six Peruvian journalists reported being harassed and roughed up in the spring of 2015. In Uzbekistan, freelance journalist Solidzhon Abdurakhmanov has languished in prison for the past seven years. All of these journalists investigated sensitive environmental subjects such as illegal logging, mining or pollution. Some governments resort to censorship whenever they are blamed for environmental problems. When “Under The Dome,” an online documentary about air pollution in Beijing, went viral in March, the Chinese Communist Party quickly had it removed from websites. In Ecuador, draconian legislation prevents journalists from covering oil drilling in the Yasuni National Park, where the biological diversity is internationally recognized. In Canada, the government gagged federal scientists to prevent them talking to journalists about the drawbacks of extracting oil from tar sands. Some environmental journalists report receiving friendly approaches from companies that are involved in projects likely to endanger the environment and resort to anything to help improve their image. Reporters in Democratic Republic of Congo said they were bribed by a British company with a concession to explore for oil in Virunga National Park that wanted to buy their silence. Canadian reporter Stephen Leahy was offered money by a Canadian mining company to stop investigating its activities. In response to all these obstacles, more and more environmental journalists are banding together in associations that aim above all to improve the quality of their reporting but also give them the opportunity to collaborate and to be better equipped and protected when they venture into the field. The COP21 Climate Change Conference in Paris is from November 30 until December 11.